Diamond Acrylic award, 3/4" thick acrylic award. Includes up to 150 words engraved. Presentation box not included. 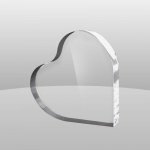 Measuring approximately 5" x 5" and 1" thick, this clear acrylic heart rests on its side to give plenty of room for your personalized message. Price includes up to 125 characters engraved.